The Political Education of Thomas Crafts, Jr.
Paul Giamatti is John Adams! Federal recognition for Freedom's Way? Samuel Adams: What did "Sam the Publican" mean? This series of postings, starting with Part 1, has brought Dr. John Jeffries from his early medical practice in Boston to floating across the English Channel on a balloon in January 1785. Jeffries then returned to London, apparently hoping for adulation as a man of science and adventure. And to some extent his feat was recognized. Jeffries was made a "Baron of the Cinq Ports," a minor honorary title. His position as a fashionable doctor seemed assured. But he didn't receive the financial reward and pension that the French king had given his companion, Jean Pierre Blanchard. In 1787, at the age of forty-two, Jeffries remarried, to a twenty-two-year-old Englishwoman named Hannah Hunt. They had several children together, though two died sadly young, according to family records: Harriet Maria “smothered" before her first birthday, and Robinson Ardesoif “burnt to death" at the age of five. Some of their other children lived considerably longer, including a John Jr. who also became a doctor and practiced for 57 years until his death in 1876. In 1789, Jeffries received letters from family in Massachusetts "urging the necessity of his immediately repairing to Boston, to secure some property which had devolved to him by the death of a near relative.” He returned to his native town with his new wife and children. His father, town treasurer David Jeffries, had never left. 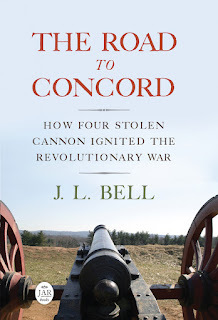 Even his medical mentor and fellow Loyalist, Dr. James Lloyd, had ridden out the war in Boston. In April 1790, Jeffries decided to stay and become an American citizen. Within a few years Dr. Jeffries was a popular local physician, respected despite his service with the British military. Local writers accepted his stories of identifying Dr. Joseph Warren's body on Bunker Hill and finding new ways to treat smallpox, though they were often self-serving. The 1801 Massachusetts Register listed Jeffries as practicing on "Franklin-Street, near the Tontine." As for the small French aeronaut Blanchard, his republican beliefs made his home country somewhat unwelcoming in the 1780s, so he traveled Europe, making the first or early balloon ascents from Frankfurt-am-Main, Hamburg, Nuremberg, Leipzig, Berlin, Breslau, Warsaw, and Vienna. After the French Revolution, the new government in Paris continued the pension that the king had granted the traveler. On 9 Dec 1792, Blanchard arrived in Philadelphia on a ship from Hamburg, bringing "4200 weight of vitriolic acid." That was, he announced in the newspapers, "the quantity necessary to effect my own ascension, once." He no longer cared for aerial companions. 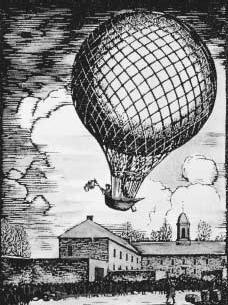 On 9 Jan 1793, Blanchard made the first balloon flight in America, taking off from the grounds of the Walnut Street Prison, as shown in the engraving above. I have heard the account of this trip from Blanchard given with feelings of asperity that were not reciprocated in my hearing by the doctor. The Frenchman was from some cause or other displeased, and being intent upon revenge took a very public manner of insulting his companion. He employed Fielding, the best coachmaker of Philadelphia, to build him a vehicle that was to go without horses. The machinery that moved it was worked by a man standing on the footboard behind, who by the alternate pressure of his feet set the wheels going and expanded the wings of an eagle, that by constantly flapping them seemed to draw the carriage along by its flight. On the panels of this carriage, which was exhibited in all the large towns in the United States, he caused the doctor to be painted in the balloon, with a bottle of brandy to his mouth, intimating by the motto beneath that without the aid of this Dutch courage his fortitude would have wholly forsaken him. Jeffries apparently kept his notes and his cool throughout the flight, so this seems to be Blanchard's jealousy about having to share any glory with his patron and passenger. Blanchard died in 1809 after suffering a heart attack during a balloon ascent. His widow, Madeléine-Sophie Blanchard, became a famous aeronaut in her own right; she died on 7 July 1819 when her hydrogen balloon caught fire and she fell to the Paris street below. Two months later, on 16 Sept 1819, Dr. John Jeffries died in Boston of, a medical colleague wrote, “an inflammation in his bowels, originating in a hernia, occasioned by great exertions in his first aërial voyage." That’s an interesting connection. A skim of Hans's article (available through Google Book, but not with a direct link) indicates that Franklin founded the club in 1774, shortly before he was lambasted for leaking Gov. Thomas Hutchinson’s letters back to Massachusetts. He left London months later, so the club must have been kept up by others after that. The article says Jeffries “often visited Paris and met Franklin,” along with a French balloonist named Pilâtre. He reportedly brought Franklin letters and packages on these visits. But Hans’s notes don’t give more details or sources, alas. This was great reading!!!! I love history.